A news item in yesterday’s newspaper made me feel extremely sad. A young schoolboy on the terrace of his grandmother’s apartment, is chased by the pet German Shepherd* of another apartment dweller, and falls to his death. A tragedy that should not have happened. The little boy had come first in his class in the annual exams, and was distributing sweets to his friends and family. So many questions pop into my mind. 1. How high is the parapet on the terrace? Should it not be high enough to prevent such accidents? 2. How safe are pets? Should not owners hold them on a leash when outside their residence – flat or house? 3. Can flat dwellers keep pets in their flats? 4. Is the dog owner accountable for any act of the dog? In this case, the dog was indirectly responsible for the child’s death. It speaks volumes for the parents’ magnanimity, that even in the midst of this tragedy, they remembered others. The little child’s eyes were harvested for donation. I feel very strongly about dogs, pets or not. The main danger from dogs is their natural inclination to bite – and bites from dogs can be fatal. A friend’s son died because of a bite from their own pet. Many years ago, my son was bitten by a dog when returning from school, barely a nip, but it had drawn blood. It was a pet dog, and its owners assured us that the dog was up to date with its inoculations. Our own doctor (Dr. Ravindra Padmanabhan – a fine person, who unexpectedly died in a car accident) said we should watch the dog for 21 days, and if it died within that period for any reason, even if it was run over by a bus or car, we should follow up my son’s treatment with anti-rabies treatment. Fortunately, the dog did not die of any cause, natural or otherwise. But it was a long 21 days for us. My second son was bitten by the pet dog of a neighbour in his own apartment complex in Hoboken, New Jersey. It was a pretty nasty bite on his thigh, and only the thick material of his jeans prevented it from being a worse one. Laws being different in the USA, the dog owner was apprehensive of a suit against him for damages, and was relieved when my son did not press any charges. He however hastily vacated the premises soon after. In the USA I found that dog owners are held responsible for their pets’ behaviour – including cleaning up after them in public places. They are also liable to be prosecuted if it causes injury to person or property. The stray dog menace is a rampant one in the city, and I have mentioned this in a previous post. Dog lovers hate me for this, because I feel strongly that such dogs should be put down for the sake of young children on the road. 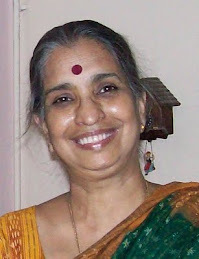 When I was a little girl, my father was Assistant Collector for a while in Trichy, on deputation from Delhi. Once while on a visit to the District Magistrate’s home, his (the DM's) pet dog bit my father on the hand. Fortunately, he was not hurt much. While the magistrate apologized profusely, the wife said, “Our dog is too gentle to bite anyone. But if you insist on putting your hand in its mouth, what do you expect it to do?” And that, I think, takes the cake! I think I love humans more than dogs – pets or not. When I go to the homes of friends who have pets, I tell them frankly about not liking being licked by their pets. My husband goes one step further – he just won’t visit them. *** Later reports have identified the dog as a Labrador. Countless words have been written on, countless opinions flung about and countless forums have discussed the representation of India in ‘Slumdog Millionaire’ and the reality in it. 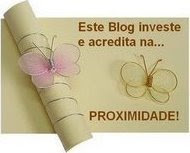 I shall leave all that to those who are better qualified than me to talk about. But there is no denying that slums are a part of India. For every Jamal who escaped there are 900,000 who continue to live there. This piece in Newsweek touched me deeply. I want to share it with you all. It tells us without any fuss or frills the true story of someone who once lived in a slum - Sudip Mazumdar, Newsweek's own correspondent - in his own words. 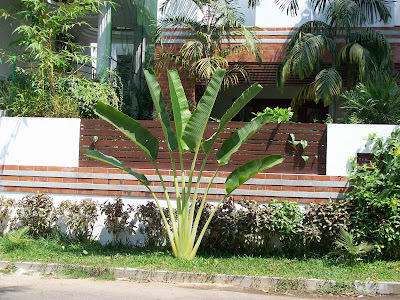 ....this lovely Traveller's Palm, known locally as visari vazhai, or the fan banana palm, and this unusual building..
On the night of Sivarathri, one is expected to stay up all night, worshipping Lord Siva, after fasting all day. Then one is assured of a place in Heaven in the hereafter, say our religious books. This year Sivarathri fell on February 23. In our neighbourhood in Mylapore there are seven Siva temples, and devotees walk from one temple to the other, and thus pass the night in participating in the poojas. 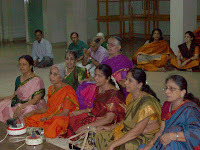 Others stay put in one place and do poojas or sing devotional songs. 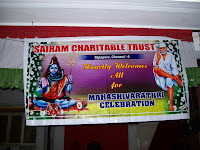 Our group Gangamritham was asked to participate in the Sairam Charitable Trust’s celebrations. We were reluctant to sing as our guru Ganga was not going to be in town, but we finally gave in, especially after Ganga encouraged us to. Only one of us, Vatsala could not make it. 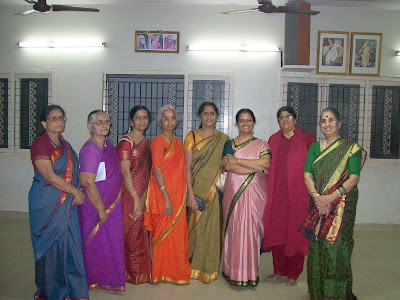 Here are the rest of us with organiser Usha (second from right). Ours was the first group to sing, and there were not many listeners, as the night was still young. The organizers told us that most people came in after visiting the temples. We sang for an hour, sans Ganga, sans mike and sans accompanists. But we were satisfied, for we had practiced diligently every day, and we knew we sounded in harmony. The seven temples in this area are all said to have interesting stories attached to them. I once did the rounds for our paper with our photographer, however it was too hot in the day time to be enjoyable. But the history of each temple is remarkable. The most famous of these temples is Sri Kapaleeswarar Temple. Parvati is said to have worshipped Siva in the form of a mayil (peahen), and hence the area is called Mylai or Mylapore. Next to it is Sri Valleeswarar Temple, where Sukracharya is said to have prayed to the Lord to restore his eyesight. Then there are the Sri Virupaksheeswarar Temple, Sri Karneeswarar Temple, Sri Malleeswarar Temple, Sri Vaaleeswara Temple (where Vaali of Ramayana fame is said to have worshipped Siva) and a little further away Sri Theerthapaleeswarar Temple, where Sri Agastya worshipped Siva, fetching water from the sea in his kamandalu. The interesting point is that these temples predate the great devotee Thiru Gnanasambandar, who lived in the sixth century and who visited all the temples when he came to Mylapore. 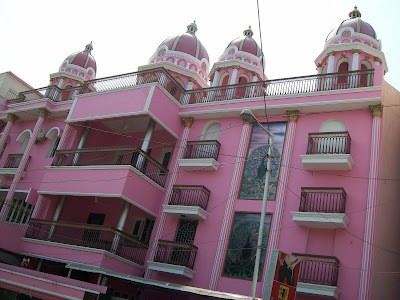 Read about the temples here.